As you know, I have been living the life of a space station astronaut vicariously through ISS Commander Chris Hadfield (who has now returned to Earth). I’ve always found space travel inspiring. As a little girl, along with my brother, we would play Connect the Dots with stars. We would spread a blanket outside in the meadow, gaze up at the night sky, and try to find as many constellations as we could… or make up our own. Here on earth, I like nothing better than lying on a beach, on a clear night in August when the best meteor showers can be seen, watching shooting stars. 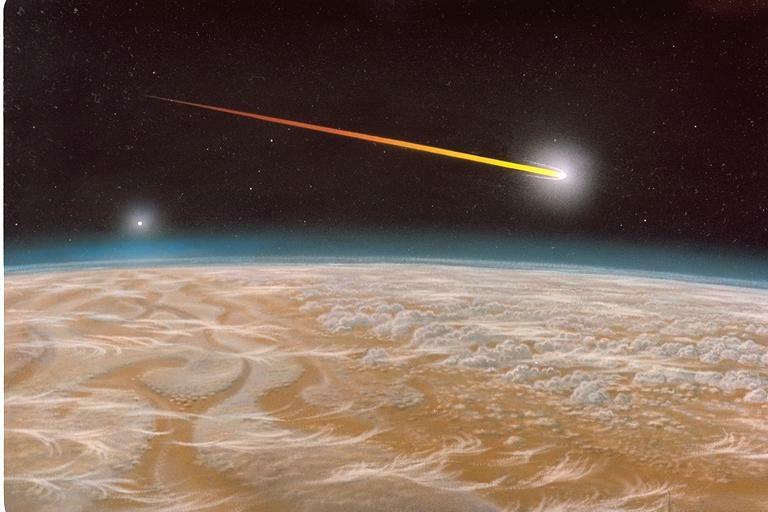 Meteor, meteorite, comet, or asteroid – I don’t always remember what the difference is, they are just beautiful. And this is all that mattered to me until I saw a documentary about the Catalina Sky Survey, and realized that our planet is surrounded by a lot of very large chunks of space debris hurtling through space. With the help of several giant telescopes, in Arizona and Australia, the Catalina Sky Survey is mapping out space in order to catalogue comets and asteroids. Some of these interplanetary rocks can be knocked out of their orbit and put on a collision course with our planet. By keeping track of these near-earth objects, the CSS would be able to give us sufficient warning and avoid deadly consequences. The asteroid that crashed on the city of Chelyabinsk in Siberia last February weighed about 7,000 tons and was the size of a bus. This was the largest strike in over a century, and it caused a lot of damage. If you want to know what is going to hit us next, go to the CSS website. These rocks are very intriguing, and since most of us are not able to travel to the crash sites and pick them up, a good place to go to view them safely is the National Museum of Natural History at the Smithsonian. Or you can visit their website. In the Mineral Sciences Collections, look at the National Meteorite Collection, which is, with 45,000 specimens, one of the largest collections of meteorites in the world. The variety of textures, patterns and even colours is astounding. They are enigmatic, unearthly, and for a jewellery maker and designer, offer challenging and exciting possibilities. 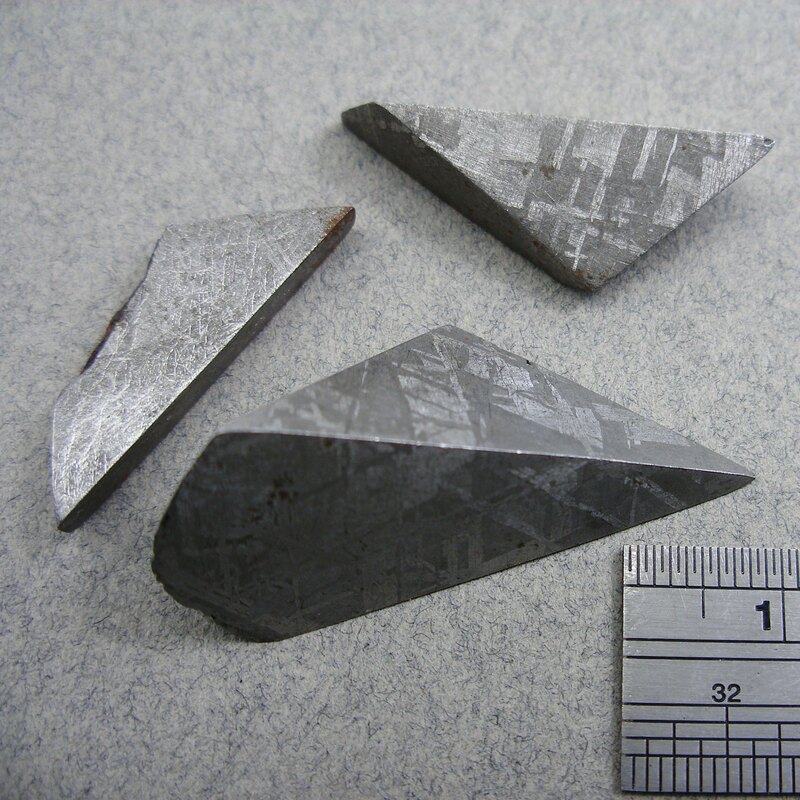 Fortunately, certain types of meteorites are not that rare and are fairly affordable. 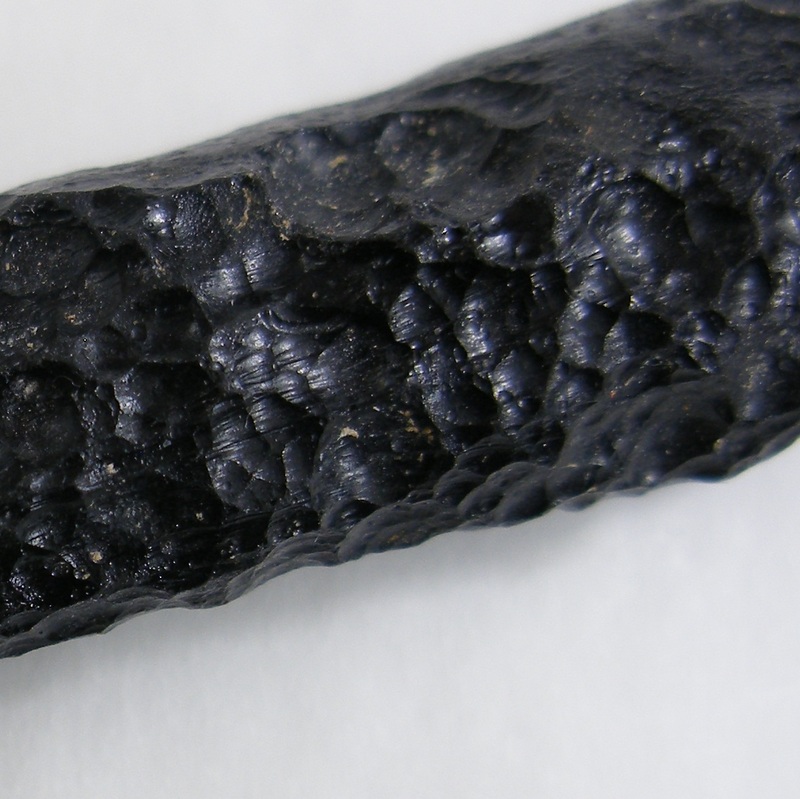 Tektites are a good example although they are not, technically, meteorites, but rather the result of a meteor crashing on the surface of the earth, melting sand and combining with surrounding rocks. So, you could say they are more like extra-terrestrial glass. They come in various shapes, mostly odd “molten” shapes called splash-forms, darkly coloured, with a glassy, pockmarked surface. They are very light, and tinkle like glass when they touch. My favourite “space rocks” are Gibeon meteorites, composed mostly of iron and nickel, with cobalt and phosphorus in smaller amounts. They are fragments of a meteorite that fell in Namibia during prehistoric times and were recovered at the beginning of the 19th century. Gibeon meteorites are extremely dense; a small piece of the material always seems heavier than it should be for its size. 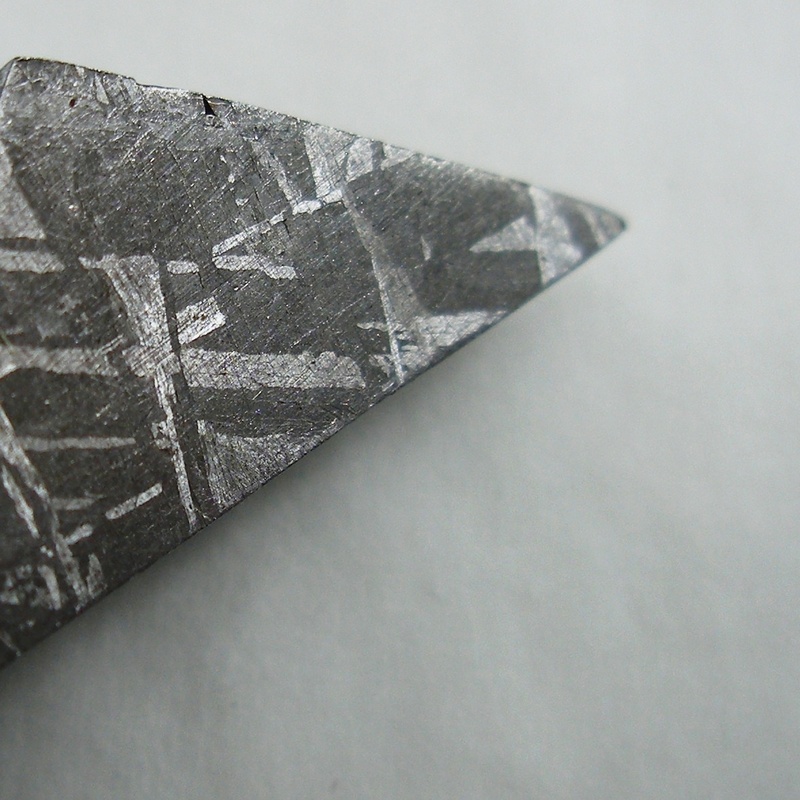 When sliced, the octahedrite crystal structure displays a stunning intricate network of marks in various shades of gun-metal grey that is characteristic of this type of meteorite and is known as the Wittmanstätten pattern. I bought several small pieces a few years ago. “Homing Device” is an example of what I made with one of them. D. Bréchault : Homing Device – Pendant with lidded stand. 14k gold, silver, Gibeon meteorite, magnet, iolite, patina. “Homing device”, a pendant with a lidded stand, is a “transformer” piece composed of three elements that can be arranged in different ways. Overall dimensions, when closed, are 5 cm (diam.) 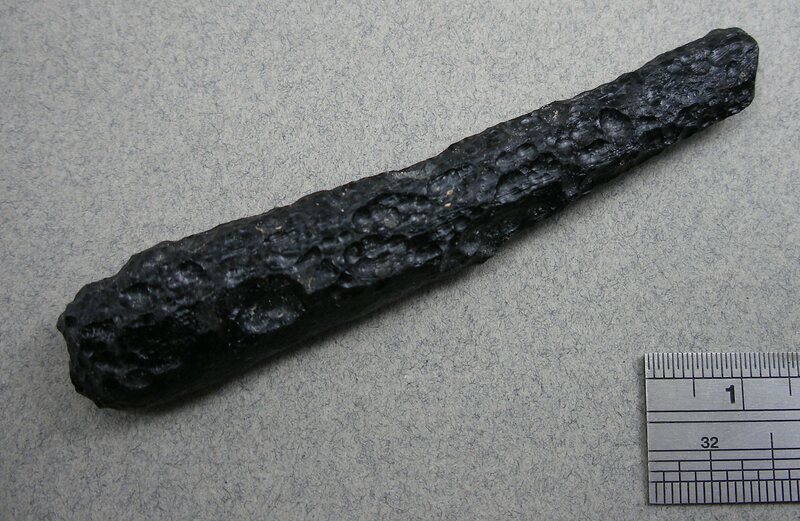 x 3.5 cm (height). 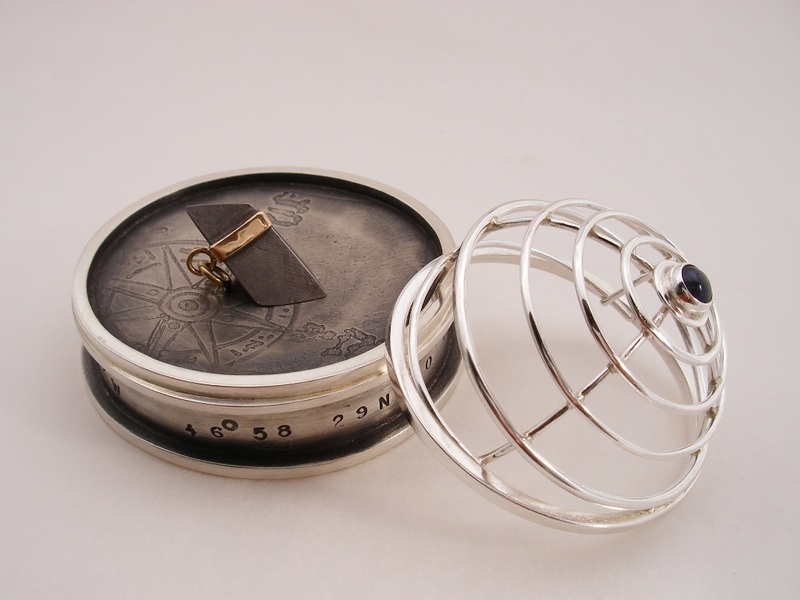 The pendant (chain not shown) is a slice of Gibeon meteorite set in 14k gold; when not worn, it can be placed on the base and used as a “compass”. 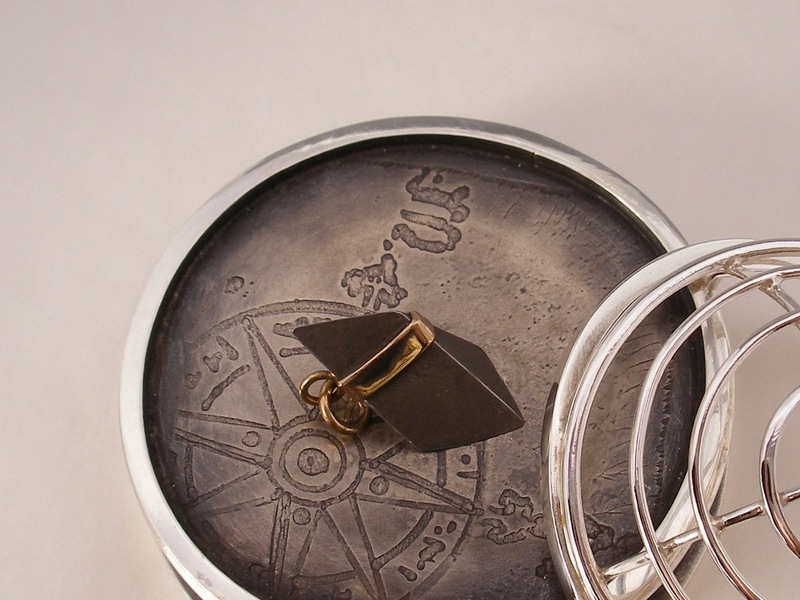 The hollow circular base, constructed out of sterling silver, is decorated with stamped and etched designs – the coordinates of my childhood home. 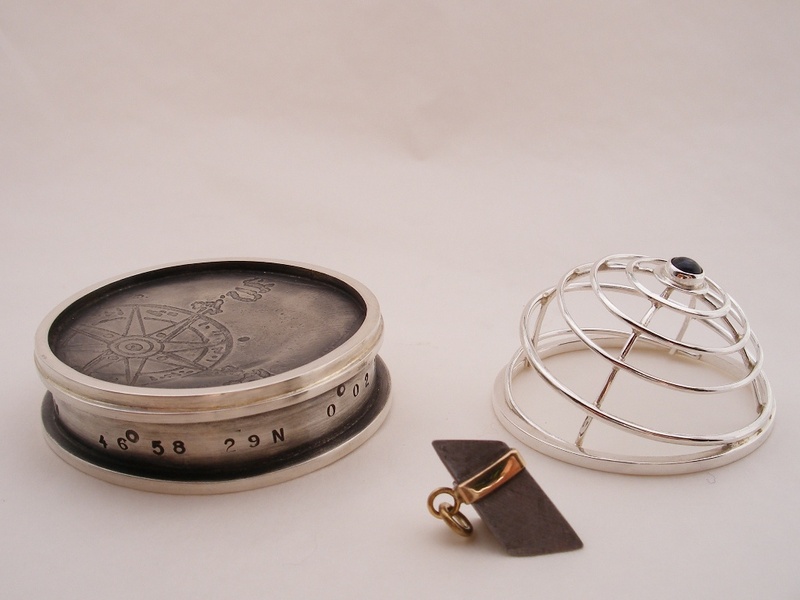 A magnet, concealed inside the base holds the pendant in place (Iron-nickel meteorites like Gideon meteorites are extremely magnetic). 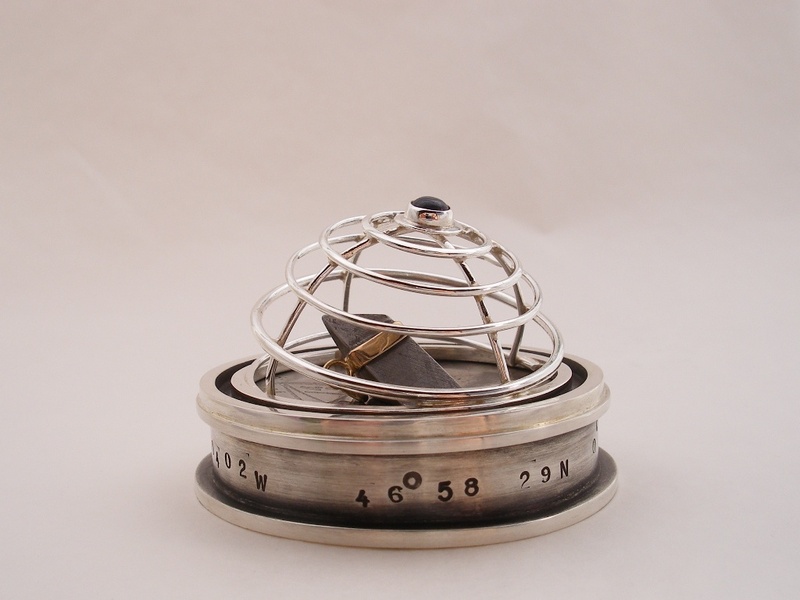 The lid, made out of silver wire, with an iolite bezel-set on the “North Pole”, is an abstract representation of our hemisphere and, when on the base, can be turned around for further “calculations” (with some poetic license). Homing Device – Overall view, closed. I am proud to announce that this piece is going to be shown in a juried exhibition commemorating the 40th anniversary of the Craft Council of British Columbia, in October 2013. This entry was posted in inspiration and tagged Catalina Sky Survey, Chris Hadfield, Dominique Brechault, Gibeon meteorite, jewelry, metalsmithing, Meteorite, National Museum of Natural History, tektite on May 27, 2013 by metalandmettle.